For fighter info, see Link (SSB), Link (SSBM), Link (SSBB), Link (SSB4), and Link (SSBU). For other variations of Link, see Young Link and Toon Link. 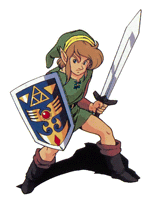 Link (リンク, Link) is the protagonist of The Legend of Zelda series. 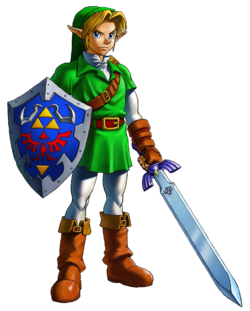 Unlike the majority of Nintendo protagonists, there are several distinct incarnations of Link seen throughout The Legend of Zelda series. Regardless, they all share the same destiny as heroes whose courage enables them to defeat powerful forces of evil and stop their conquests, most notably Ganondorf/Ganon. Other hallmarks shared by the Links are their ability to wield the Master Sword and their possession of the Triforce of Courage, although these are not depicted universally. 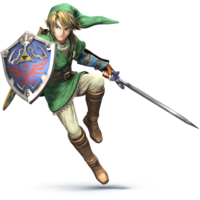 As a member of the "perfect-attendance crew", Link has been featured as a playable character throughout the entire Super Smash Bros. series. Compared to the rest of the crew, however, he holds the distinction of doing so in name only because of three of his incarnations (the Hero of Time, the Hero of Twilight, and the Hero of the Wild) appearing as playable characters. By extension, prepubescent incarnations have also been playable, with the first instance of this occurring in Super Smash Bros. Melee. Due to the consistent critical and commercial success of The Legend of Zelda series, Link is marketed as one of Nintendo's flagship characters alongside Mario, the company's de facto mascot. Link's first appearance was in the original The Legend of Zelda, which depicted his quest to rescue Princess Zelda and the land of Hyrule from the evil Ganon. Link is designed with a green tunic and a green hat, which, like Mario's design, was due to the NES' hardware limitations. This appearance has since been traditional for Link, with the exception of his appearance in Breath of the Wild, which nevertheless features versions of his traditional green clothes as unlockables. It is worth noting that while there have been multiple games within The Legend of Zelda series, it has not always been the same Link who the player controls. This is evident with the fact that are there multiple timelines within the series, wherein many games typically feature a new Link with a new origin. Notable examples include "Hylia's Chosen Hero" (referring to the Link from Skyward Sword), the "Hero of Time" (referring to the Link from Ocarina of Time/Majora's Mask), the "Hero of Winds" (referring to the Link from The Wind Waker/Phantom Hourglass), and the "Hero of Twilight" (referring to the Link from Twilight Princess). However, each incarnation of the hero is tasked with defeating the main antagonist of the story, most frequently Ganondorf/Ganon, from either taking over the world or, in other cases, destroying it. Due to the The Legend of Zelda series giving Link simple and concise answers that the player can pick instead of traditional dialogue, there is very little insight into the personalities of the majority of his incarnations. While the only incarnations to expressively show distinct personalities are the ones from The Wind Waker/Phantom Hourglass, Twilight Princess, Spirit Tracks, Skyward Sword, and Breath of the Wild, universal traits among Link's incarnations are bravery, humility, and politeness. One thing that has varied with Link is his age. In some games, such as The Wind Waker and the present timeline of Ocarina of Time, Link is a child, with these two particular incarnations being represented as playable characters in the Super Smash Bros. series. In Twilight Princess, Skyward Sword, Zelda II: The Adventure of Link, Breath of the Wild, and the future timeline of Ocarina of Time, Link is depicted as a teenager. However, the only teenage Links to appear as playable characters in the Super Smash Bros. series are the Hero of Time and the Hero of Twilight, his descendant in Twilight Princess. Regardless of his varying ages, Link almost always starts out as a normal person until learning of his heroic destiny and, as his journey presses onward, gradually progresses into a full-fledged hero. For example, Ocarina of Time features him as a young boy whose mother entrusted him in the care of the Great Deku Tree before dying. The Wind Waker also features him as a young boy, albeit living a happy and carefree life on Outset Island alongside his grandmother and younger sister. In Twilight Princess, he is an ordinary young man working at Ordon Ranch. Breath of the Wild is one of the few exceptions to this rule, introducing him as a knight and a descendant of many other knights. 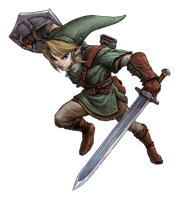 Official artwork of Link in Super Smash Bros.
Link's first appearance in a fighting game, and by extension his first official appearance in a Nintendo game outside of his home series, is in Super Smash Bros. as one of the eight starter characters. The incarnation that appears is the Hero of Time from The Legend of Zelda: Ocarina of Time. He is a slow, heavy character whose Master Sword grants him many disjointed attacks that allow for ranged combat. His neutral special move is Boomerang, which is a fast attack that will return to him. His up special move is Spin Attack, which boasts impressive power, but is cited as his main weakness due to its lackluster recovery potential. Lastly, his down special move is Bomb, which can be thrown either directly at opponents for combos, or to rest on the ground. Due to his flaws, Link is currently ranked 11th of 12 on the tier list, placing him in the C tier. Link is the valiant boy hero of "The Legend of Zelda" series in which he fights against the evil Ganon to recover the Triforce. Though his tools may change with each adventure, his strength and righteousness remain constant. With his trusty sword and a variety of weapons, he takes adventure head on! 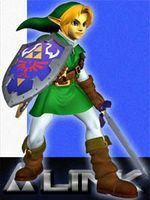 Link, as he appears in Super Smash Bros. Melee. Link returns in Super Smash Bros. Melee as a starter character. He retains his Ocarina of Time design, although redesigned in a way so that he has a far more detailed look, even more so than the game his design is based on, largely due to the improved graphics of the GameCube. While his playstyle has been largely retained, his moves have been slightly tweaked. Spin Attack is now a much more reliable recovery move. Like the rest of his fellow veterans, he received a fourth special move, with his being Bow. It is a neutral special move that allows Link to fire an arrow, with the arrow's range being dependent on how long the player holds down the B button. As a result, his Boomerang has been moved to be his side special move. Link has been buffed in the transition to Melee. In addition to retaining his Master Sword's disjointed range and his numerous projectiles, Spin Attack covers more distance in the air and his faster air speed. However, he has a very slow dashing speed, and is easy to combo due to his heavy weight and quick falling speed. Thanks to his buffs, Link is currently ranked 18th out of 26 on the tier list. This places him at the bottom of the E tier, and renders him as the lowest ranking mid-tier character. Even in his youth, Link was already becoming the warrior who would carry the destiny of Hyrule (and many other lands) on his shoulders. His epic struggles against the forces of darkness are written in legend, and he is bound to the Princess Zelda and the archfiend Ganondorf by the awesome power of the Triforce. Link, as he appears in Super Smash Bros. Brawl. Unlike the previous two installments, Super Smash Bros. Brawl does not feature the Hero of Time. 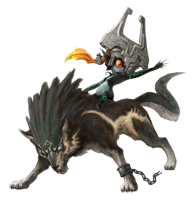 Instead, he has been succeeded by his descendant, the "Hero of Twilight" from The Legend of Zelda: Twilight Princess. 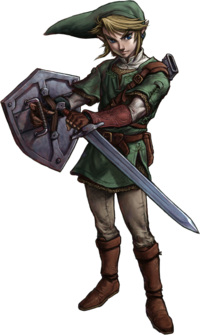 While this Link's playstyle is essentially the same as his ancestor's, some of his moves are slightly different in order to match his aesthetics and functionalities in Twilight Princess. This is most apparent with the Gale Boomerang and the Clawshot: the former can pull opponents and items toward Link with a small tornado, whereas the latter can grab an edge, but not walls. Other changes include the arrows of his Hero's Bow, which now disappear after a distance, and his Spin Attack now being chargeable. Like the rest of the cast, Link has a Final Smash that he obtains when he breaks a Smash Ball. In his case, his Final Smash is the Triforce Slash, in which light from the Triforce of Courage on Link's hand shoots out and traps an opponent in between two large Triforce-shaped force fields. Link then dashes at the opponent, unleashes a barrage of slashes, and then finishes with a powerful blow with enough knockback to one-hit KO the opponent if nothing gets in the way. While this Link's attacks are stronger, his mobility and recovery are very poor, to the point that the latter is comparable to his ancestor's in SSB. Due to his weaknesses largely outweighing his strengths, Link is currently ranked 35th out 38 on the tier list. This places him in the F tier, and renders him as a bottom-tier character. A young man who emerged to rescue Hyrule from peril. He's the bearer of the Triforce of Courage who fights to keep Ganondorf from conquering the world. His green outfit is a constant throughout the series. He's a skilled swordsman, horseman, and archer. He's also proficient with bombs and boomerangs. Link with a Smash Ball, releasing his ultimate attack. Light flares from the Triforce symbol on the back of his hand and rushes out to meet the enemy he faces. The enemy gets trapped within the glittering Triforce, is quickly cut to shreds, and is launched by the last strike. The attack works on one enemy at a time, so it's best to go after the character in first place. Link's alternate form in the Twilight Realm. In this form, he cannot use weapons such as swords or shields, but he can attack with a ferocious wolf bite. He also has a number of unique skills inherent to his beast form, such as a keen sense of smell, the ability to dig, and a loud wolf howl. Link, as he appears in Super Smash Bros. 4. The Twilight Princess incarnation of Link reappears as a starter character in Super Smash Bros. 4. However, his overall color scheme is noticeably more vibrant because of SSB4's aesthetics. Link has been buffed in the transition to SSB4. Many of his attacks are faster and stronger, while SSB4's new edge mechanics make his Clawshot's tether recovery more dependable. His projectiles have also seen some improvements: Hero's Bow charges faster, Gale Boomerang's new launching angle improves its follow-up potential, and Bomb deals more damage if it explodes near the opponent's feet. However, Link is still highly susceptible to rushdowns because of his rather sluggish mobility, while some of his attacks' damage outputs were slightly lowered. Thanks to his buffs largely outweighing his nerfs, Link has been able to attain some notable players in tournament play and achieve respectable results, even at the national level. As a result, he is currently ranked 31st out of 55; in addition to placing him near the top of D tier, this renders him a mid-tier character like his ancestor is in Melee. Mii Swordfighters dressed as Link. In addition to his playable appearance, Link's appearance serves as the basis of a downloadable content costume for Mii Swordfighters. 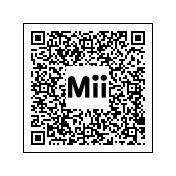 Nintendo also released a QR code for those who wish to have the exact Mii used in the costume's advertising. 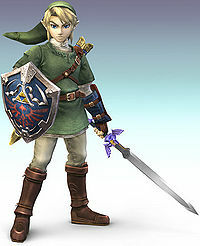 While the costume is based on Link's SSB4 appearance, its simplified design, brighter color scheme, and mirrored hairstyle closely resemble the Skyward Sword incarnation of Link. Green tunic? Pointy hat? Yep, it's Link, all right! In this game, his sword and shield make for effective attacking and blocking, and his bow, bombs, and boomerang will spice up any battle. He's even brought his Clawshot for grabbing enemies and edges. Jeez, just how much stuff can Link carry? Green clothes? Pointy hat? Yep, it's Link, all right! In this game, his sword and shield make for effective attacking and blocking, and his bow, bombs, and boomerang will spice up any battle. He's even brought his Clawshot for grabbing enemies and edges. The hero of Hyrule is really kitted out for a brawl! If Link was on a desert island and could only pick one item, it'd be his powerful sword. This weapon is key to his down-air attack, a move with great launching potential and the ability to strike twice. He can also strike twice with his side smash—the second blow deals more damage and launches harder. Of all of his weapons, Link's sword may be the most lethal. His down air attack has incredible launching power. What's more, he'll bounce up afterwards, allowing for a follow-up strike. His side smash can also be followed up with a more powerful second blow that sends foes flying - just press the button again straight away. The children from Kokiri Forest never seem to grow into adults. Just a young boy, Link is entrusted with a quest by the Great Deku Tree. He leaves the forest and eventually finds the Master Sword in the Temple of Time. When he awakes, he is seven years in the future and an adult! Link was once a carefree lad living with the Kokiri in Kokiri Forest, but one day, the Great Deku Tree entrusted him with an important task and he had to leave. His quest led him to find the Master Sword, and when he took it, seven years passed in the blink of an eye. Before he knew it, Link had grown into a young man! Hold on a sec! Where's our dashing young swordsman? Oh... This IS him, just...in wolf form. When he steps into the eerie Twilight world, Link becomes this rough-looking beast! Luckily, he turns back into normal Link eventually, but with the Master Sword letting him transform at will, he might feel like going wolf again from time to time. Link (Champions Tunic), as he appears in Super Smash Bros. Ultimate. Link returns in Super Smash Bros. Ultimate as a playable character. 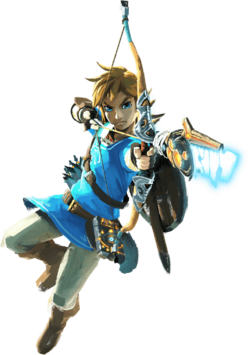 Like Brawl, Ultimate features a new incarnation of Link succeeding a previously playable one; in this case, it is the "Hero of the Wild" from The Legend of Zelda: Breath of the Wild. In addition to wearing the Champion's Tunic as part of his default costume, Link has the Wild Set of clothes as an alternate costume. Compared to his predecessors, Link features a few noticeably distinct properties to his moveset. These most notably include the Remote Bomb Rune instead of traditional Bombs, the ability to fire two arrows simultaneously, his lack of a Hookshot or Clawshot, and his Final Smash utilizing an Ancient Bow to fire an Ancient Arrow. On a minor note, Link is also right-handed as in Breath of the Wild, in contrast to his playable predecessors. Unlike past smash games where link is mid or low tier, in Ultimate link is considered high mid tier. Some pro players such as notably "ZeRo" have said that Link has a great potential to be a very good fighter in Ultimate. Link's Wild Set in Super Smash Bros. Ultimate. Link and Princess Zelda are the only playable characters in the Super Smash Bros. series who have varying designs based on different incarnations of their namesakes. In Link's case, his Hero of Time incarnation is playable in SSB and Melee; his Hero of Twilight incarnation is playable in Brawl and SSB4; and his Hero of the Wild incarnation is playable in Ultimate. 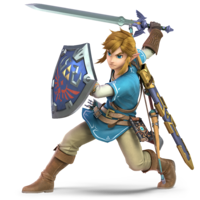 Skyward Sword is the only non-"Toon" 3D console game whose incarnation is not represented directly by Link himself in the Super Smash Bros. series. Link and Captain Falcon have shared the same weight value throughout the Super Smash Bros. series. As of Melee, Link is one of only three characters who has a forward smash that can unleash a second hit upon a second button press. Fittingly, he shares this trait with Young Link and, prior to 'Ultimate, Toon Link. Link is the only The Legend of Zelda character to be a starter character in every installment. Coincidentally, Link's appearance and design in both even-numbered Super Smash Bros. games use a graphically-improved version of the design used in the game said design originated from, which was also used in a demo for the consoles said Super Smash Bros. games were based on: the SpaceWorld 2000 GameCube Tech Demo and the Zelda HD Experience for the Wii U, respectively. Palutena's Guidance is the first official source to refer to the Breath of the Wild incarnation of Link as the "Hero of the Wild". This moniker was originally coined by fans, derived from the Tunic of the Wild and the naming pattern of the other Links' amiibo-unlocked tunics from that game (the Hero of Time's tunic is called the Tunic of Time, the Hero of Twilight's tunic is called the Tunic of Twilight, etc). This page was last edited on April 2, 2019, at 11:54.